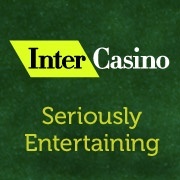 There are not many casinos online that are able to claim 15 years of operation but InterCasino is one of those. They opened early in 1996 and continue to offer exciting online casino games, top notch customer support, generous casino promotions and top performing casino software from Cryptologic. It is important to know that InterCasino is a licensed casino in Malta. Malta is one of the best countries who license online casino and only those who are safe and operate to the highest standards are licensed there. Being a licensed casino is one way InterCasino displays its dedication to its players through honest operation and accountability. The casino offers you a choice of 200 plus games. You can select from more than 100 slot games or if you prefer table games, video poker, or blackjack you will find many of those styles of games offered. Cryptologic is always working to create new casino games and some of the more famous games they are known for include the Marvel slot games they are licensed to offer to players. These games are superb as they include loads of features and multiple jackpots – four to be exact. All of the games offer strong graphics, include the latest animation features and plenty of game features players love to see – free spins, bonus slot games, you name it and you will find it at InterCasino. The casino is available in two software styles, download and no download. Both of these include a great variety of games but it is always best to download the software if you want to be able to play all of the games. Signing up is fast and you can be playing in minutes so be sure to stop in at InterCasino if you are looking for world class casino gaming action. InterCasino just released a few new promotions geared for new players. This includes a first time match bonus worth up to $/£/€ 250! They include a monthly bonus called “Bonus 4 Life” that gives each player at the casino a bonus special just for them based on how much they played in the previous month. Look for regular promotions each month that are over and above the usual. InterCasino is one of those online casino who almost always has something new to offer all players so it is good to check the promotions page often. The casino is player support focused and includes support agents who are available to help you whenever you need it. The support department never closes and can be reached using telephone, email or the live chat service they offer. They even offer support in many different languages so that players who do not speak English or Spanish for example are able to speak to someone who speaks their language. When it comes to depositing and withdrawing InterCasino gives you loads of options to choose from. All the typical options can be used like credit cards or many of the popular prepaid cards but also some direct deposit options and many of the popular e-wallet companies are included. All of these can be used when wishing to cashout your winnings but some credit cards cannot be used for withdrawals.